Members of Tenterden-based Wealden Business Group (WBG) and their guests travelled to Bruges on Wednesday (27 March) to celebrate 20 years of successful networking and business-building. The Group meets over breakfast every Wednesday at the Little Silver Country Hotel, Tenterden to exchange information and sales opportunities, as well as inviting external speakers and supporting local charities. 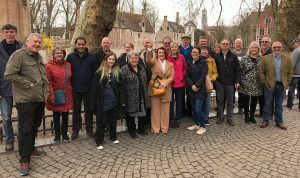 The Group holds its annual meeting next Wednesday (3 April), when a new chair and officers will be elected, an initiative is set to be announced to recruit new entrepreneurs; and a charity will be nominated for support over the next 12 months. Says outgoing chair Graham Card: “WBG has proved to be one of the most resilient business groups in the county, regularly generating more than 200 business leads annually between our members.